I’ve been fighting the gray for seven years. Where some women turn to dyes, I turn to paint. This was a serious job. Our original laminate countertops were primarily cream but had a little gray in them. I really wanted our main floor to be shades of brown, so I painted the kitchen 4 times trying to find a color that made the countertops look more cream than gray and settled back on the original ivory when all was said and done. Six years later we upgraded our laminate countertops to granite and as G and I walked through the warehouse picking out slabs I said, “I just don’t want it to have any gray in it” about 258 times. Turns out there’s a lot of gray in granite! We decided on a slab that had the light creamy colors I was looking for and the dark brown and black colors G wanted, with the least amount of gray veining I could find. Once it was installed I loved it, but couldn’t help but notice my kitchen still had a case of the grays! Our most recent kitchen upgrade was our DIY tile backsplash – and even that had some gray undertones taunting me! My decision to paint our kitchen (again!) came a few months ago when I was at Sherwin Williams looking at light gray paint samples for my friend Jill’s living room. I was drawn to this one particular shade that I knew would be too dark for Jill’s taste, but I couldn’t stop going back to it. Suddenly I realized, “This would look gorgeous in our kitchen!” Sherwin Williams was having a big sale that ended that day, so I threw caution to the wind and bought myself a gallon. The color is Sherwin Williams’ “Anonymous.” It wasn’t a super huge risk, considering the other main paint color in our downstairs open floor plan is also Sherwin Williams, so I was able to compare this gray swatch to the Sherwin Williams Whole Wheat color in our living room. One wall in our kitchen runs all across the back of our house into the living room, so once I knew it looked good with our living room wheat color I whipped out my wallet. I also wasn’t worried about going too dark with the gray because our main floor is almost entirely windows so we get a ton of light. I did, however, decide to just paint two of the kitchen walls and leave the third one ivory so it wouldn’t feel too closed in. Plus that third wall meets up with the dark orange paint color in our entry and hallway. I knew the gray and orange would look great in the same space, but I didn’t want them touching. Here’s a look back at the progression of our builder basic kitchen to the space it is today! The Beginning: Our kitchen when we first moved in. Major Change #1: New granite countertops. 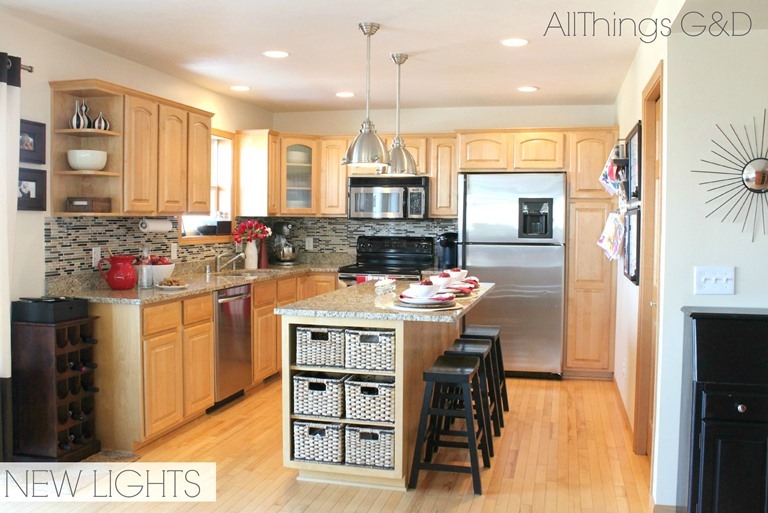 Major Change #3: New pendant lighting over the kitchen island. Our kitchen today with new gray walls! 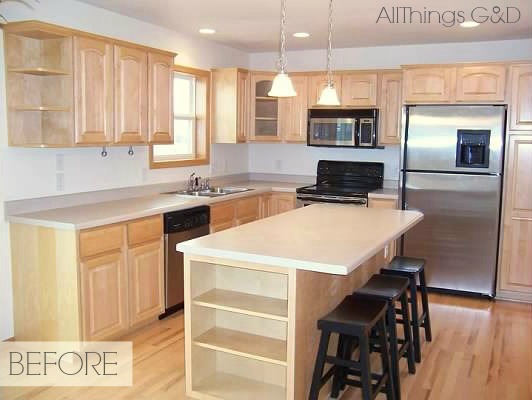 Our kitchen – before & after! After 7 years of fighting it, I’ve finally decided to embrace the gray – and I love it. I like to consider it a sign of adulthood. Looks amazing! i love how it warms the whole space up! Thank you, Shannon! 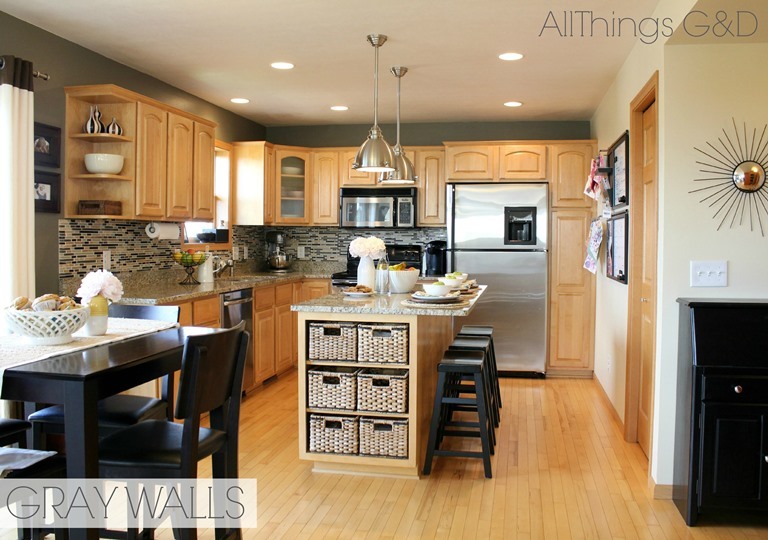 It’s hard to believe what a difference those few inches of wall color above the cabinets can make, isn’t it? I’m so thrilled with how it turned out! I love grey, and your kitchen looks fantastic. (I’m pretty sure we have Anonymous in our bedroom) We have maple cabinets with cream laminate in our new house. Your old colors look just like mine, and your granite is exactly what I want…thanks for doing it all first so I can see how it will look! Sending my hubby a link to your kitchen to hopefully light a fire under him to get that project in the works! What luck! I’m happy to inspire, Lindsay! I know how helpful it can be to find examples of what you’re going for before you take the plunge. I had a hard time finding pictures of our granite and our tile in a kitchen with light maple cabinets, which was super frustrating. I’m so glad we went ahead with what we did though – I love how it all turned out! Good luck to you on your kitchen remodel! It looks so rich! Great choice. I’m in the process of picking all of the paint colors out for our new build – such a chore. And yes, I’m going gray. In more ways than one! Thank you so much, Julie! And good luck to you with your paint color selection. Seven years after moving into our house, I’m not sure we have one single wall in the entire place that has the same paint color I started with, haha! Hopefully you’re less indecisive than I’ve been! Looks great! It really ties it all in together. Thank you! It’s amazing what a little paint can do, isn’t it?! Really nice! It’s the finishing touch but a HUGE IMPACT~! Wonderful! My kitchen is still a work in progress but your provides inspiration to finish. Thank you so much! It’s been a long process, as I’m sure you’re familiar with, but it’s certainly worth it in the end! Good luck with yours! Sometimes it’s all about the process! I was anti-gray until a few years ago. I painted my LR & Kit Raccoon Hollow which is a cobo of gray & a smidge of brown. Looks different in different lights and I love it! Sounds beautiful, Robin! I hope to see you at Haven, too – it’s going to be a blast! Oh Dusty I absolutely love it all! I swear we have the same cabinets and just about the exact same granite. 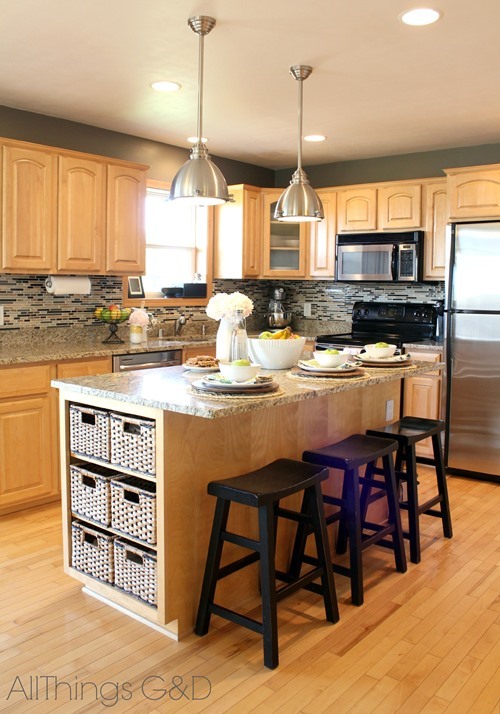 Your choice of tile for the backsplash is perfect! 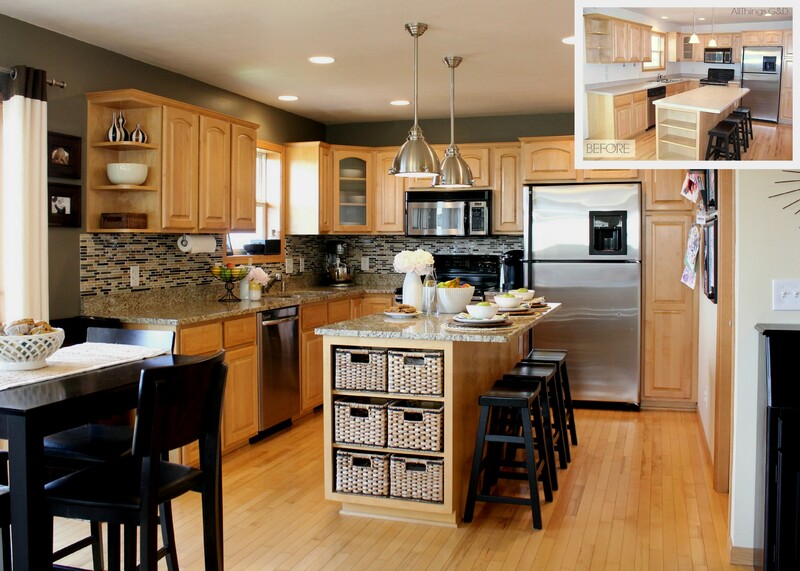 But most of all, that gray gives the kitchen an extra rich look and helps create beautiful contrast! Pinned & shared your post on my FB page! Thank you so much, Kim! And thank you for sharing!! I’ve been meaning to ask you – what did you decide on for a faucet after Delta? Oh My WORD! It is so pretty! I am coming over for breakfast! LOL Jen! You’re in luck – we’re having waffles! Super sophisticated! It’s the perfect shade for everything else you have going on. 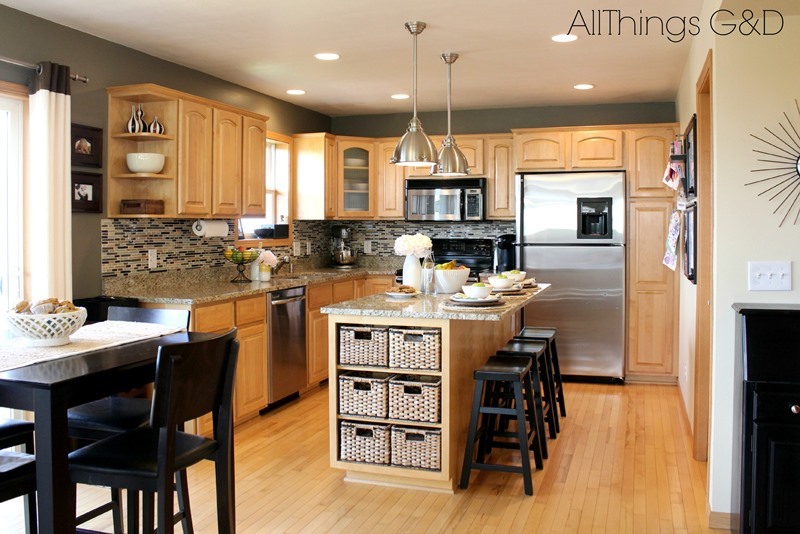 Have you thought about adding “jewelry” to your cabinets? I’m always amazed at what hardware can do. Thank you so much, Andrea! I’m a pretty “clean lines/less is more” kind of girl, so cabinetry hardware isn’t really my thing, but I’m sure they would look great if a future owner wants to add them! Thanks for your comment, Sonia! I actually really like our light maple cabinets and they’re in great shape, so I don’t foresee a paint job in their future. We also have maple hardwood floors, so they compliment each other well. Thank you for your feedback, though! Thank you so much, Jesse! It’s such a great color – I had to stop myself from going crazy with it and repainting the whole house, haha! Would love to add your drapes to your new home. Can you tell he where to purchase? Off to buy Anonymous!! Our drapes are from West Elm, purchased a few years ago. What finish was the gray paint, satin? Thanks. Beautiful! Can you please tell me what color the “cream” wall is? It looks very nice with the gray…! very pretty! can you tell me, what type of wood flooring do you have? Thank you, Alicia! We have light maple hardwood floors. Thanks for sharing this beautiful inspiration! Can you tell me where you got your pendant lights over your island? Thanks again! I’m usually not one to like Grey walls (my inner 15 year old doesn’t want to do anything that “everyone else” does), but I think it looks great and I love the backsplash. Thank you so much, Elizabeth! I lol’d at “my inner 15 y.o…” – I think my sister has that same inner voice. She still refuses to read the Twilight books even though I know she’ll love them. Your kitchen is beautiful. I finally know how to embrace our honey oak cabinets. I already have a new black dining set picked out. Thanks for the great ideas. I have been wanting industrial pendant lights like those for a while now. Yes…. Love it. !!!!! 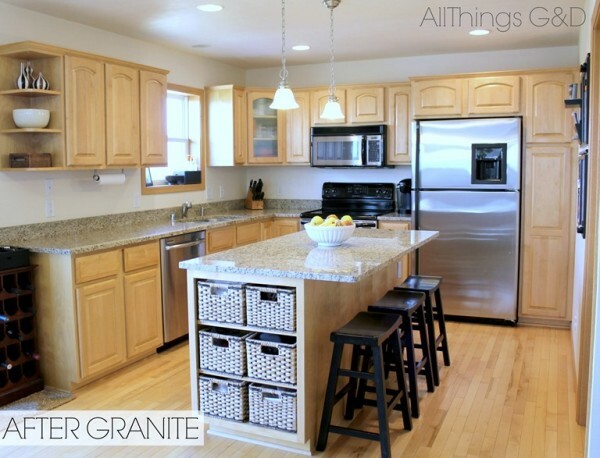 What is the name of the Granite ? I love your kitchen My cabinets and granite are the same color and the walls in my open concept are a lighter green color. Hoping to do a similar backsplash and the green color you have in the kitchen. Hello.. I absolutely love your kitchen color… I have the same exact kitchen and have cream walls and I was stumped on what to paint the kitchen.. but this grey would go perfect.. I really love your kitchen table and I can not find one like that..may I ask where you got it? Thank you so much, Tiana! I’m so happy to hear our gray kitchen inspired you! To answer your question, we purchased this kitchen table from Target.com about 9 years ago. It’s counter height and has a butterfly leaf in the center. I’m not sure if they still sell this exact model, but hopefully you’ll be able to find something similar. Good luck! I Love your kitchen. I’ve been searching for a new wall color and back splash to go with our oak cabinets. I also have black counter stools and Stainless appliances. Great job! We have the same maple cabinets that you have and are working with them as we update our kitchen. We were looking at a darker floor, but I really like your lighter floor. We were afraid a dark floor would also make our small galley kitchen look even smaller. I would love to know what your granite is as that’s one decision we haven’t made yet. I love yours! We are also looking to do gray paint and a similar backsplash. Thanks for the inspiration! I want to thank you from the bottom of my heart. 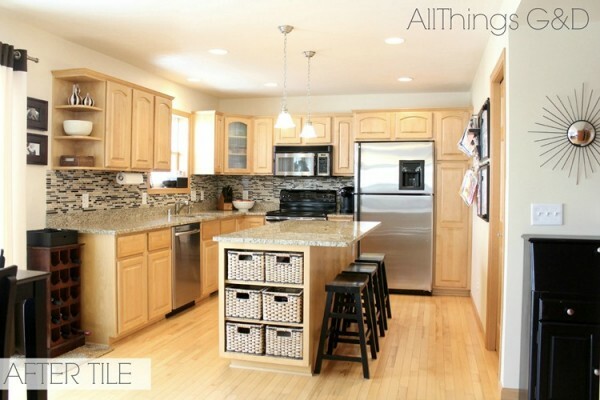 I used SW Anonymous in my kitchen with my orangey maple cabinets and 2hat a difference it made. I love my cabinets again. Thanks so much for sharing your kitchen and paint colors! My question —— WHERE ON EARTH DID YOU FIND YOUR BASKETS ? And what were your measurements?